Prepare this delicious Chocolate Graham Cracker Dessert in just 30 minutes, plus refrigeration. 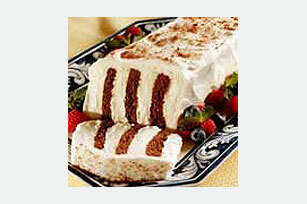 Chocolate Graham Cracker Dessert will look amazing at your next gathering with friends and family. Mix COOL WHIP and vanilla just until blended; spread 1 Tbsp. onto each of 20 graham squares. Stack grahams together, then stand on edge on platter to make 8-1/2-inch loaf. Frost with remaining COOL WHIP mixture. Crush remaining graham squares; sprinkle over loaf. Refrigerate 4 hours before slicing to serve. Assemble dessert as directed; freeze until firm. Wrap tightly; freeze up to 2 weeks. Thaw in refrigerator 1 hour before serving.